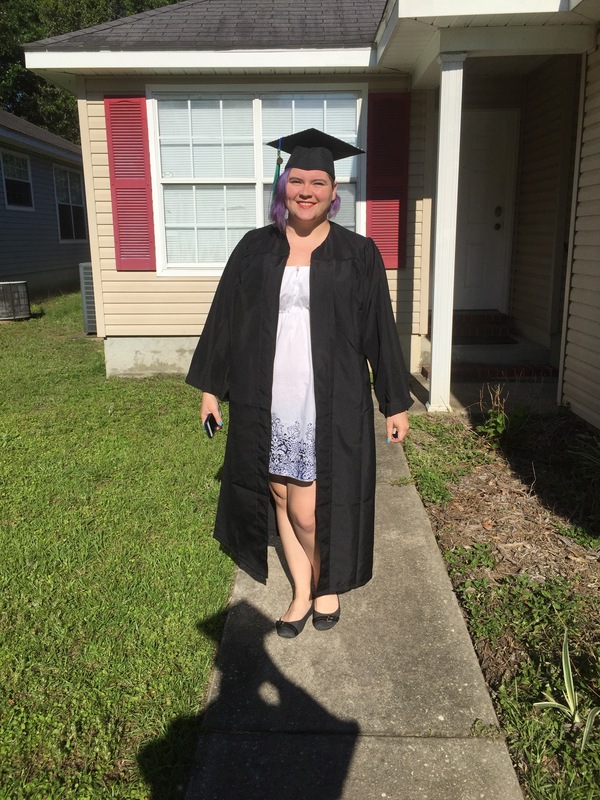 I graduated! Woo! I still can’t believe that I have a degree. That I finished four years of schooling, in just four years. This day has been on the horizon for so long, but I never really felt like I was going to reach it. It was like in those dreams you have where you’re walking down a hallway and it just stretches out longer and longer ahead of you and you feel like you’ll never reach it. College was like that for me, but I did it! The few days leading up to graduation were stressful and busy. My best friend’s Graduation party was on Thursday night, and then I had work on Friday. We had originally planned to have a graduation/going away party Friday night, but we got last second tickets to see Boston and Kansas preform that night and I’ve postponed the party. After the concert we picked up craft supplies, because my best friend and I wanted to decorate our caps. 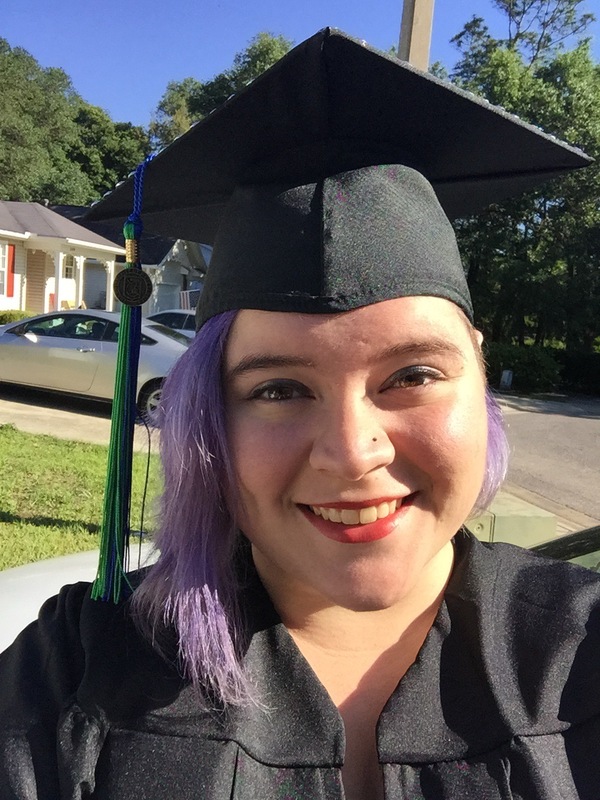 I never knew how many DIY things I would have to do for graduation. My high school graduation didn’t allow us to decorate our caps, and since I didn’t decide to graduate until a week before, I had to get a lot of stuff done in a short amount of time. On our way to the concert we used pintrest to find ideas for our grad caps. I knew I wanted something Disney related, but didn’t like any of the ones I saw. I finally found a quote from my favorite Disney movie that I could use. Making the boarder was the most difficult part. I counted out how many of each letter we would need before we got to the store so we would have enough letters. We only ended up needing two packs of lettering for both caps, but we bought four just in case. Since we were doing this the night before graduation we didn’t want to run out of anything we needed. We also bought an extra bag of gems because at the time I was going to line the entire boarder and didn’t know how many I would need. Ended up using less than one bag. I knew I wanted something more than just the quote to fill some of the space. I ended up buying a cheap graduation card and cutting this cool diploma out of it. I think it all turned out really great. It was a fun project to do and a great momento for the future. My best friend was originally going to do a completely different cap. We were going to print out a map of Florida and draw a line from our city to Tallahassee, since he’s going to FSU for grad school and write “Next Stop Grad School” on it. Tired and sleep deprived walking around Walmart at 1:30 am we saw the googly eyes and he said he wanted to use it. I immediately said “Look who’s graduating” but it seemed silly since we’d be in a room with 2,000 other students who were graduating. 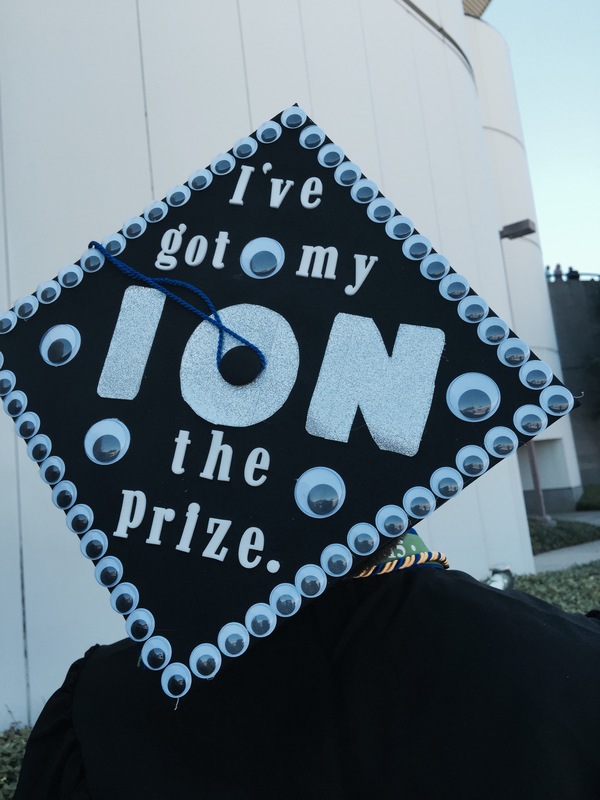 So then I said “I’ve got my eye on the prize” and he countered with “I’ve got my ION the prize” since he’s a chemistry major. His was fairly easy to make since it’s mostly wiggly eyes. We bought poster board letters for the ION part, and covered it in silver glitter duck tape. He had a blast making it and it got tons of attention at graduation. They even showed it on the main screen while all the graduates were walking in. The title of my post comes from a part of the speech the president of the university made at the beginning of commencement. 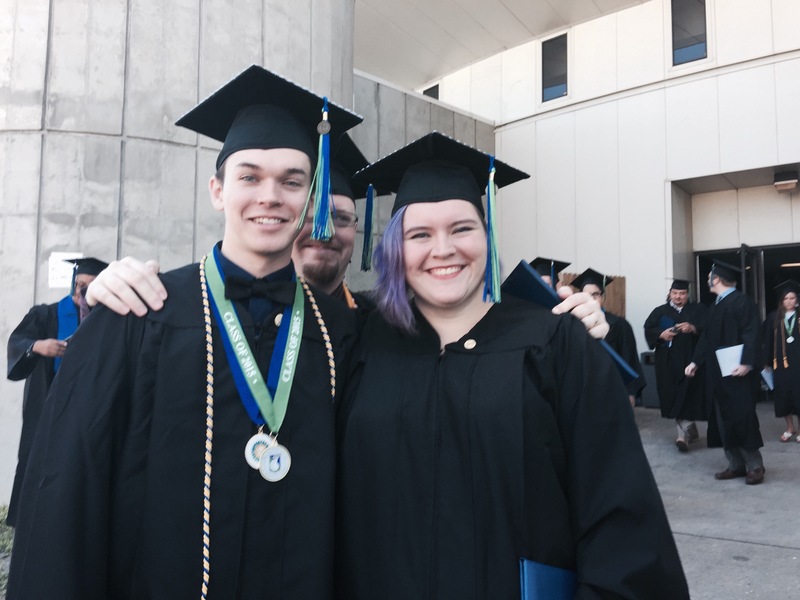 She said that we were all finishers because we had followed through getting our degree all the way to the end. She said this was something we could take with us our whole lives and it showed that we could be counted on to get something done. I feel like it’s another one of those quotes I’ll hold close when I feel hopeless. I’m a finisher.